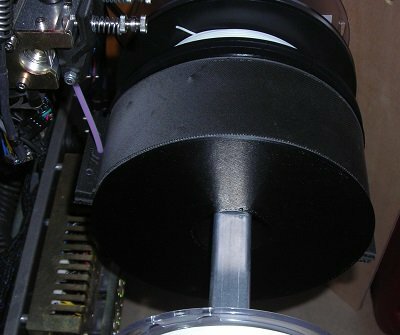 To have filament feed out of the spool two screws are loosened so that the cover can freely rotate around the spool. For storage the screws are tightened, which completely closes the cover, and prevents filament from being able to exit the spool. It also keeps air exchange to a minimum. While this is not an airtight design I think with the right material for the cover it could be made into an airtight enclosure. STL files for the two part spool and two part cover are included. To assemble you will need a short piece of PTFE tube, an M3 setscrew to hold the PTFE tube in place, and four short M5 screws to assemble the cover, and close or open the cover. The PTFE tube is not essential, but as you can see in the photo it nicely bridges the gap from spool to extruder entry and thus keeps filament completely enclosed and away from dust.